This is a screengrab from the inside shot. I love that when you’re viewing it online you can turn around and zoom with keyboard controls. So problems that are easy to spot before I can develop it further are, I’m quite prominent in the frame, and staring at myself is not what I want to do – solution, test different ways of holding the camera and GoPano setup. Light needs to be good as the phone auto corrects as we move through and it doesn’t cope well with internal lighting. 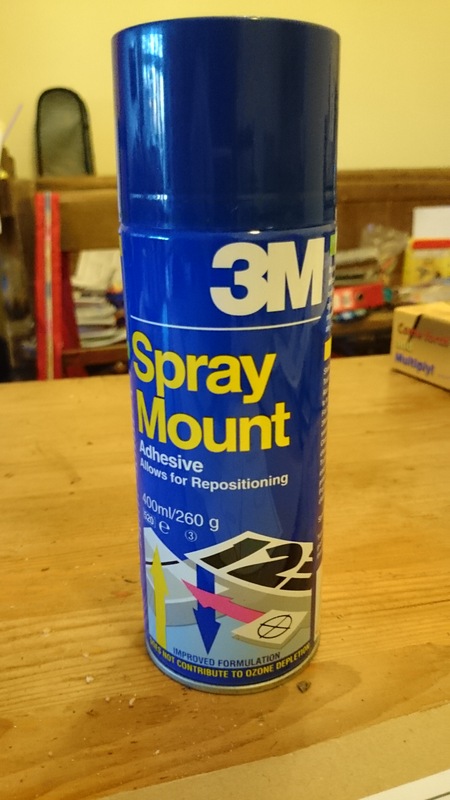 Finally – quality, is it up to scratch, this can only be really tested when I go a step further and see if I can view this video in my google cardboard VR glasses..
Lastly can I take it into a programme and add interactivity? What I really want is one where the viewer can drive the movement, similar to Fibrums Rollercoaster where you start the ride by focusing your gaze on the ‘go’ lever within the environment. Titans of Space® is a short guided tour of a few planets and stars, the point of which is to give the player a sense of scale of just how big these planets and stars are compared to each other. Again this uses the mechanic that you have a virtual crosshair and focussing where you are looking, at a trigger will reward you with a reaction in game, very clever stuff.. I would ideally be able to wander around the created environment just by turning my head and opening doors or entering corridors with this virtual crosshair as my controller. 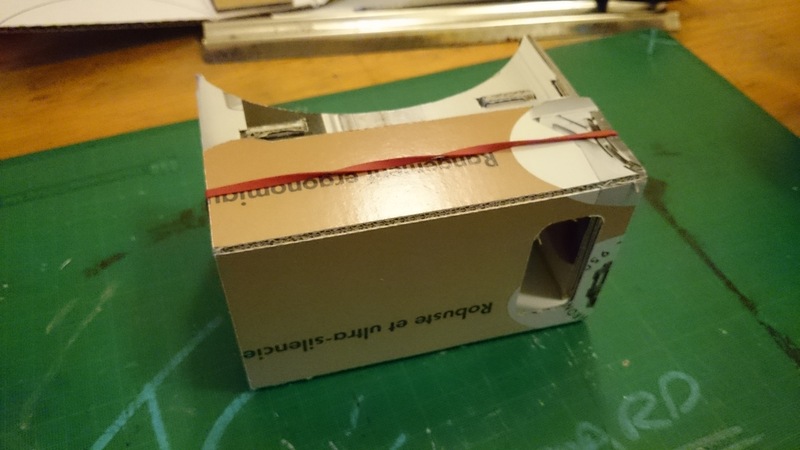 So I need to trial different capture methods to minimise my presence in the resulting video and test the video from gopano site with google Cardboard to see if it’s compatible… will report back soon! 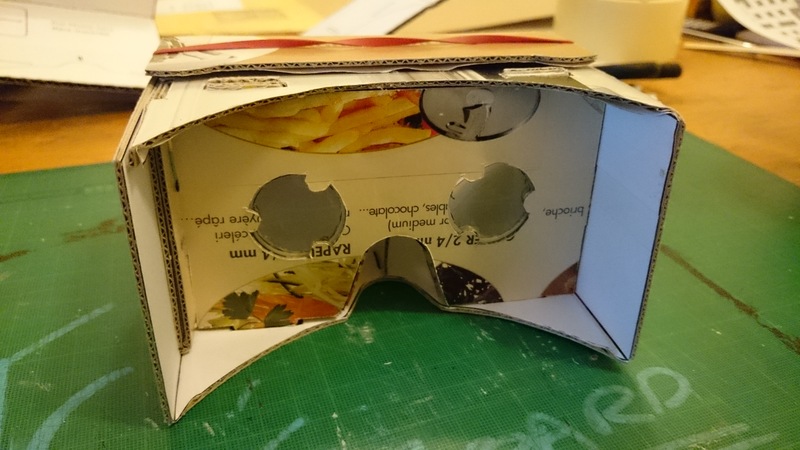 Since making my own Google Cardboard I have been looking at how I can put my own content into it. 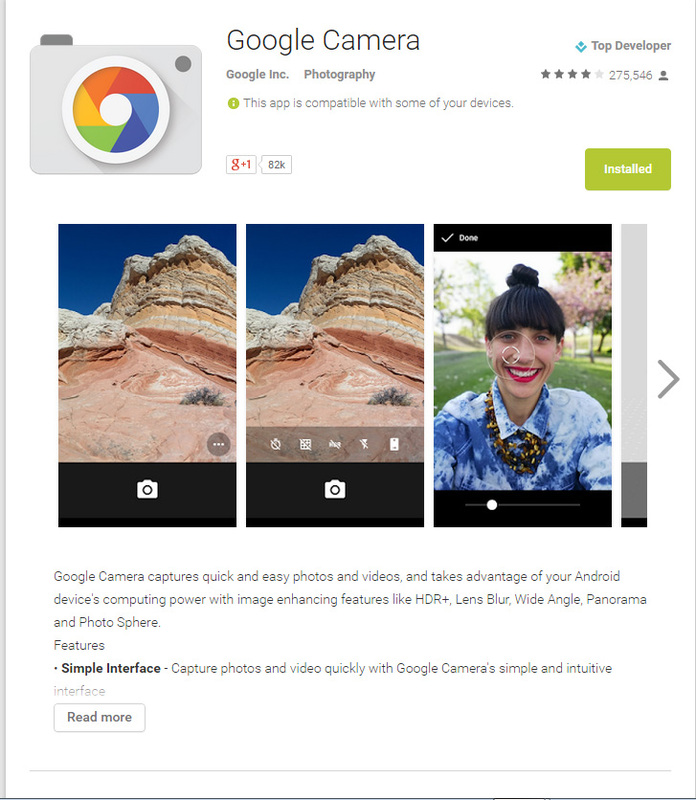 The easiest and quickest way is to take a full 360 panorama photo (known as a photosphere) using the Google Camera app, which appears automatically if you have a google device, or can now be downloaded from the app store onto any android device. 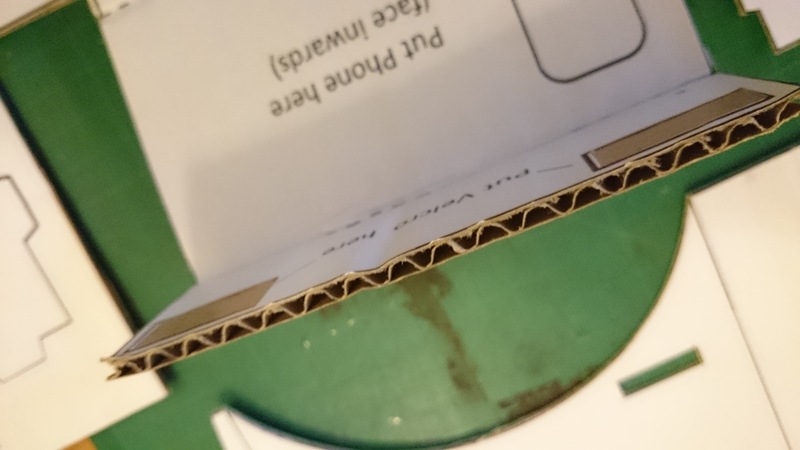 This is a really quick and interesting image to view in the Google Cardboard viewer, you select it from the list when you turn the google cardboard app on, it then takes you straight through to your last photosphere image. It’s very eerie viewing a fully immersive scene – and it really works well – when not in that particular place. The first shot I took was of my office and when I viewed it back on different occasions found it quite disorientating as the day I shot it, it was sunny, so to put myself into that moment on a cloudy day, and it to be so lifelike, when you ‘came out’ of it, it was quite impressive. It’s not perfect, I actually have two computers and screens on my desk, but because of the limitations of the camera/app/360 capability, it appears I only have one as a portion has been overlapped so much, but, on the whole, it really puts you there, in the other space. 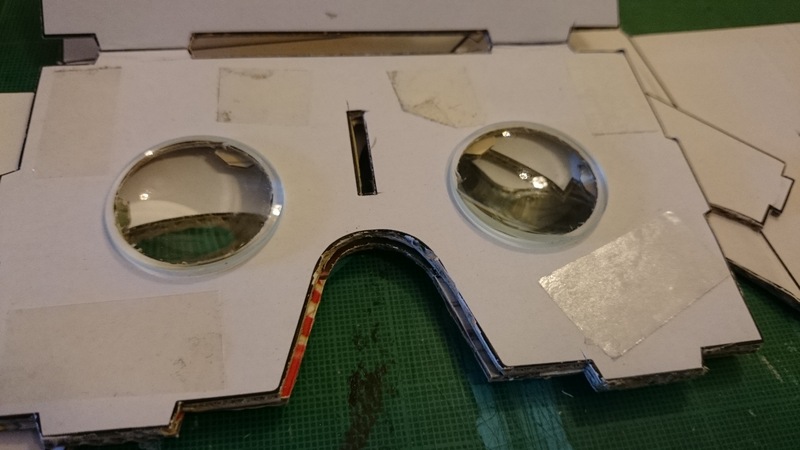 The google cardboard photo viewer automatically works out the side by side bi-ocular view and the refresh rate when turning round is practically real time, I didn’t notice any lag whatsoever. When I showed this to my children (my testers for anything), they thought it was great and wanted to take photospheres in every room, so that they could sit in a different room and view the other room… I 360’d our kitchen and they then wanted to show all their friends that they could be ‘in the kitchen’ whilst anywhere else in the house. Great fun. It’s very effective, but, I want to do 360 video. S0, investigating this and I come across a wonderful app (to be used with google cardboard) made by a very clever company called Jaunt, featuring a song with Paul McCartney where not only have they produced 360 video which you can look all around, but the sound is also 360… Put on a good pair of headphones, download this app and see the future of music videos! 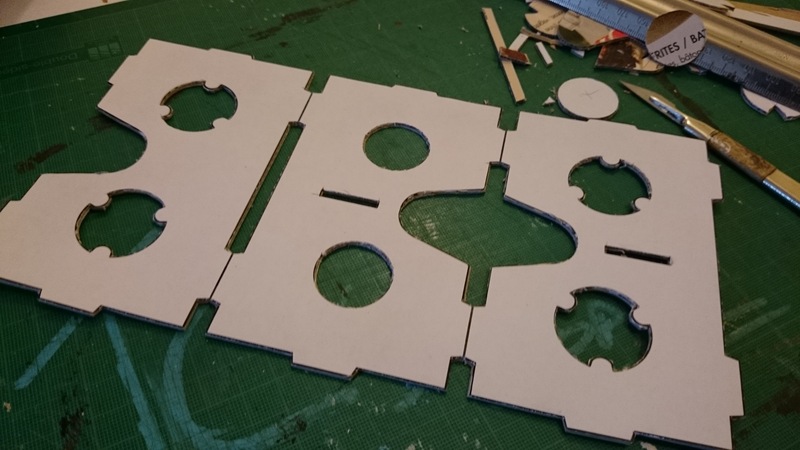 But how would I replicate this, on a budget and without access to the latest gizmos…? Go Pano produce a large and expensive option of a lens add on to a pro camera, costing $500, but, I have found they also do a micro version for just $29, which a uk company sell for £24 (http://www.red-door.co.uk/pages/productpages/gopano-micro-iphone.html) which is a great price and will help me experiment, but it will only fit onto an iPhone 4, 4s and 5, which I don’t have and seems to be no update for, so leads me to believe it’s not very good or not very popular, so I’d need to get my hands on a phone pretty soon to trial it. So I could for about £100 get some 360 video, but I would love to make it slightly interactive, such as in the FiBrum VR Rollercoaster, where to make the experience start you have to concentrate your view on a red lever which starts the ride. GoPano – A special lens attachable to iPhone that allows you to take panoramas and panoramic videos. It works by having a 360 degree lens and bend the light into the iPhone camera. Works for iPhone only. 360 degrees horizontally only. Kageto – A company manufacturing the Dot, Lucy, and Jo. They are successive versions of a special lens attachable to iPhone or Android to take panoramas and panoramic videos. Similar to GoPano, 360 degrees horizontally only. BubbleScope – Another attachable lens to iPhone for capturing panoramas and panoramic videos. Similar to GoPano, 360 degrees horizontally only. 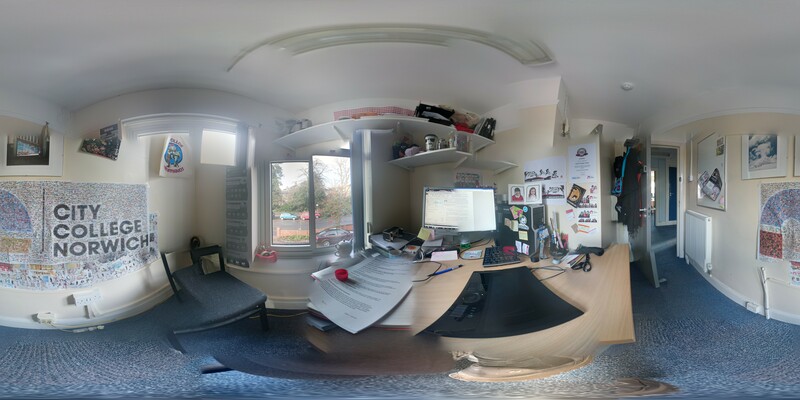 So yes you can take 360 video – with a small budget – with a few limitations, but good enough to test my proof of concept for interactive live 360 video, when my Go Pano Micro turns up, I’ll report back. 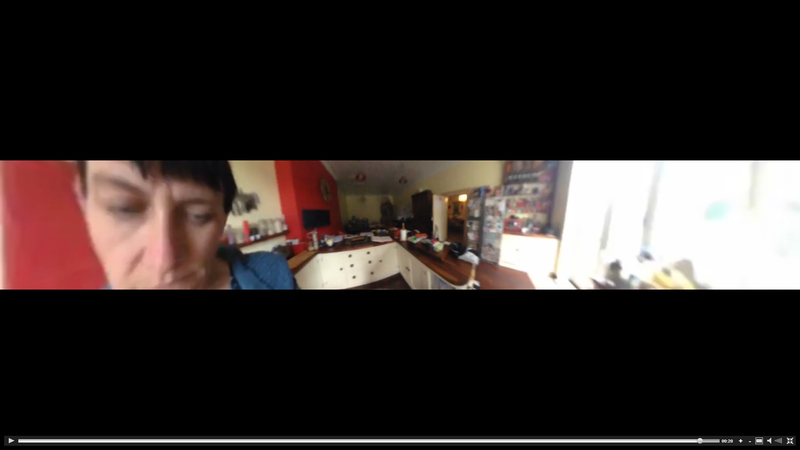 I decided to go for the Go Pano as the video from the Bubblescope looks particularly poor on first glance and the Kogeto seems to be very proprietary and I haven’t been able to find any video to view – as yet. 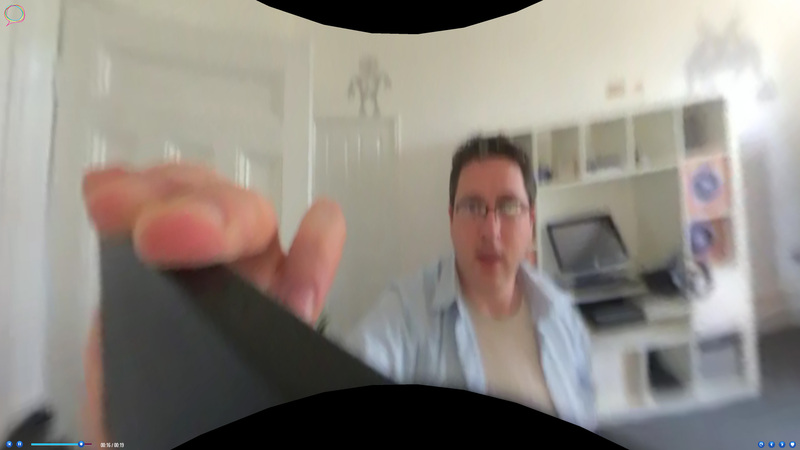 But as an aside, both of these 360 add ons have the attachment flat to the phone, so you cannot get rid of the black box of the phone in the resulting video, see bubblescope still below. 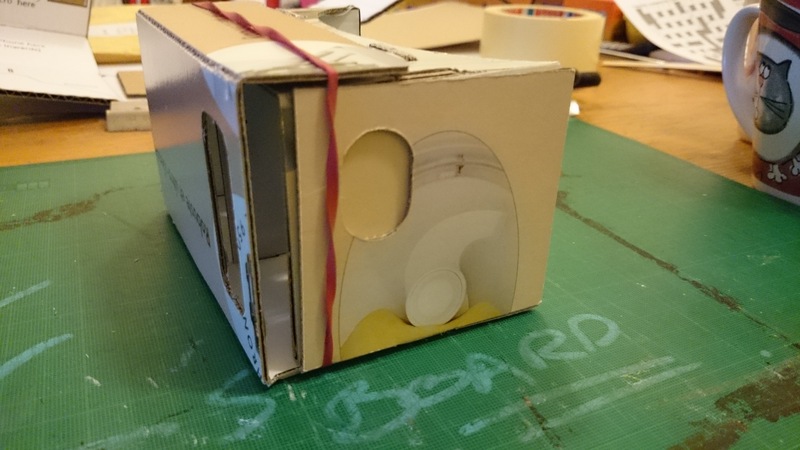 Google Cardboard – VR out of a box! 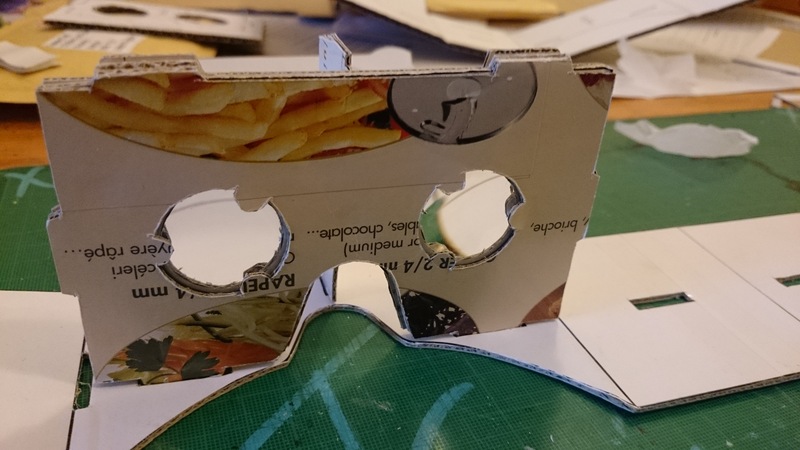 So at last I had enough time to finally put together the VR Google Cardboard DIY headset. 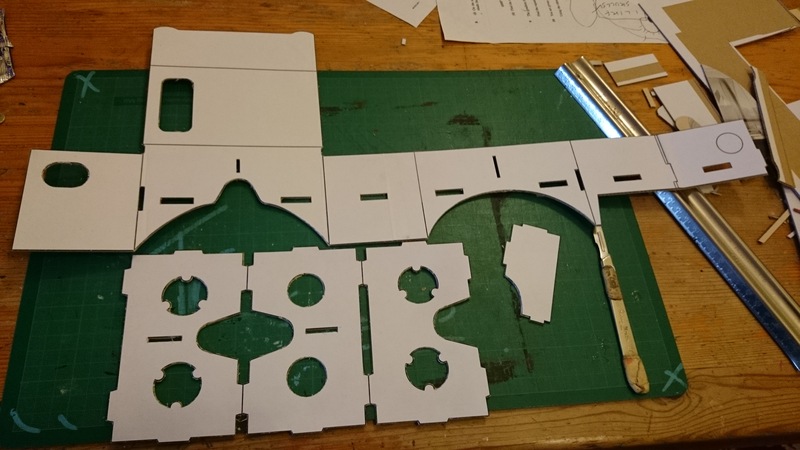 I had previously purchased one off of ebay, but it was so poorly cutout and made, I couldn’t even fit an old ipod touch into it, however, what it did get me was the lenses and the NFC chip that are actually quite tricky to get hold of. 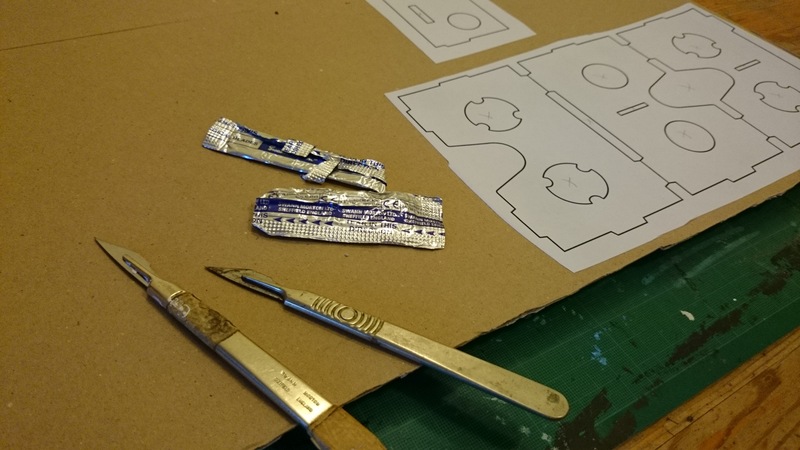 First step was to cut out the paper printouts and make sure they all would fit into my lovely bit of cardboard, I found that the regular corrugated stuff was not very usable. 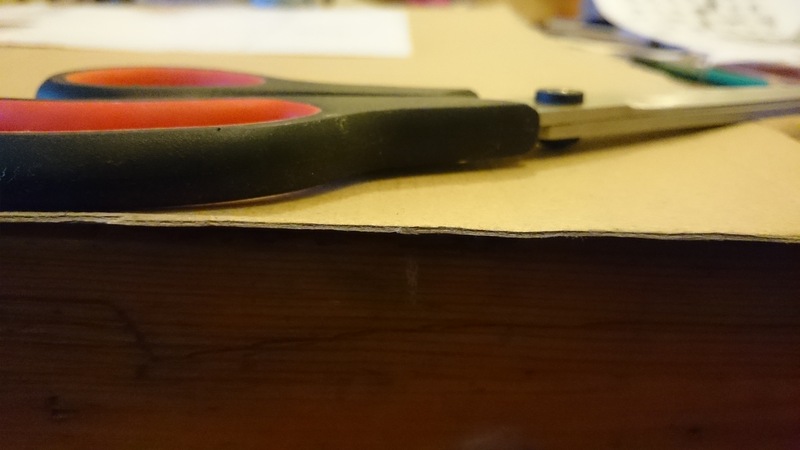 This the lovely thin but firm cardboard I rescued from a magimix box, just the right type of stuff. 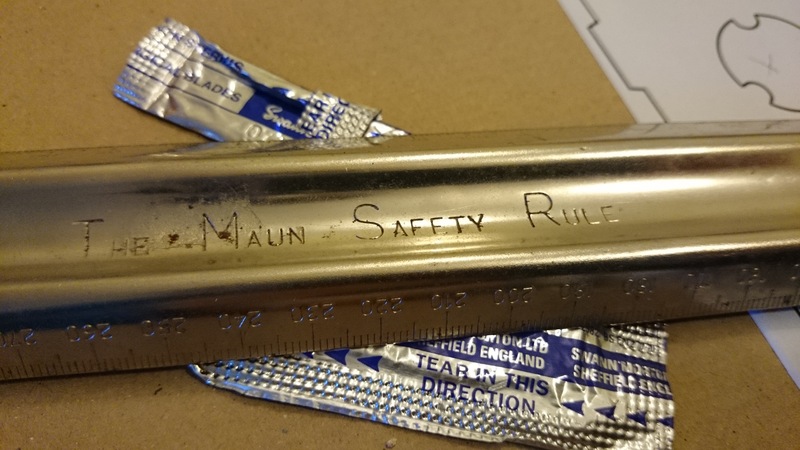 Safety ruler at the ready and I start with the complicated section to hold in the lenses. 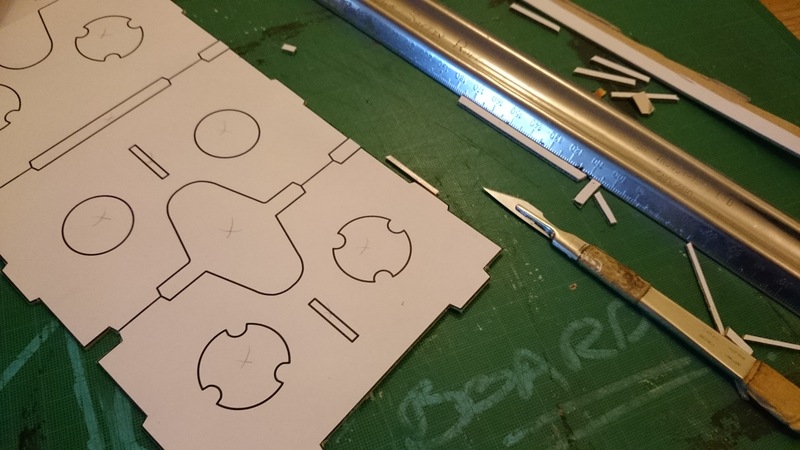 Straight sections are a breeze but the circular areas look impossible to get smooth. Looking pretty good, but it does take me 45 minutes to cut all the fiddly bits out, but I am very pleased that I haven’t lost my knife skills. 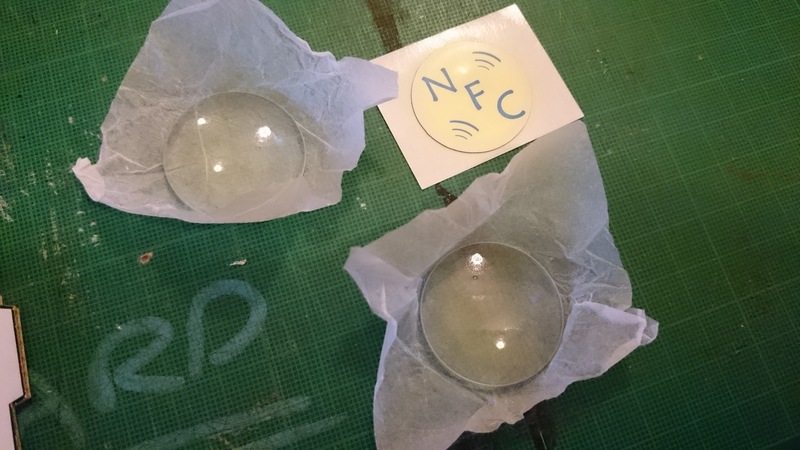 Lenses and NFC chip ready to go in, but where? 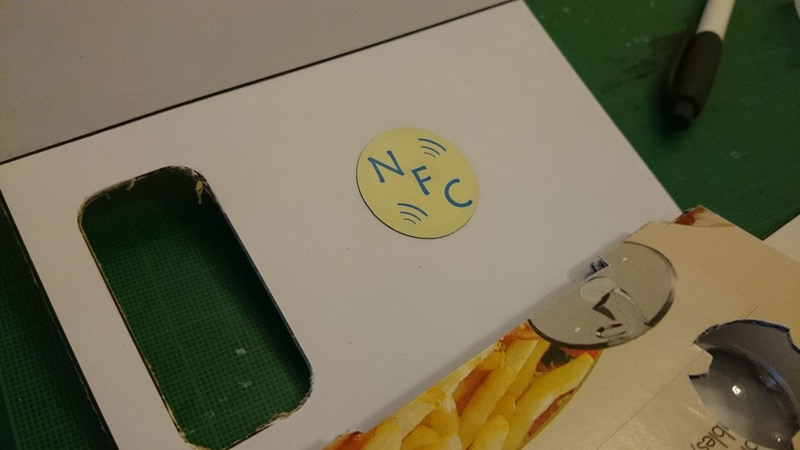 This is where the NFC chip for Google Cardboard goes! Add a bit of double sided to keep the lenses in position and squeeze it together. Space in the side for my phone to slide out! 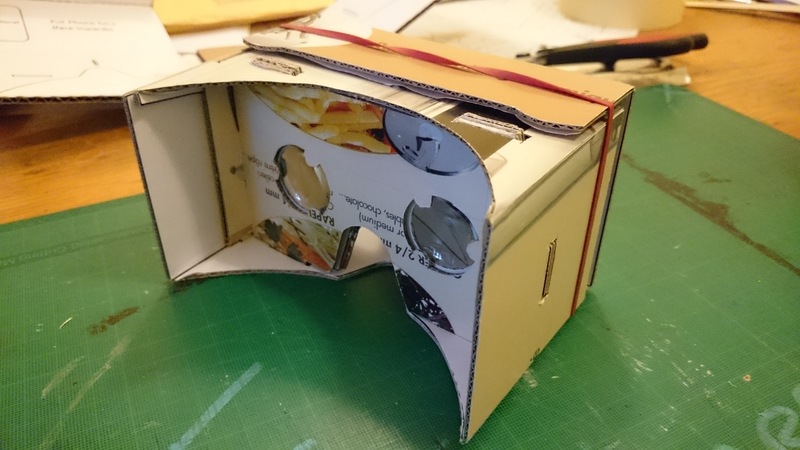 Unfortunately, because my box is not plain cardboard it looks like I now have a magimix VR food viewer, but hey let’s give it a go! The first experience I want to try with GC is the Paul McCartney and Jaunt 360 app that I have already downloaded onto my phone. When I tried this without the GC it was amazingly clever, as the sound moves around as you turn, and with good headphones on is mightily impressive. Then I have a look at what’s available within the Google Cardboard app itself on the Play store, it has a few things, one of the nicest was ‘windy day’ a cute little animated 360 film about a mouse with a big hat on a windy day. The funniest thing about this was I was obviously facing the wrong way and didn’t realise there was a character ‘stood’ behind me, I was just looking at the falling leaves! 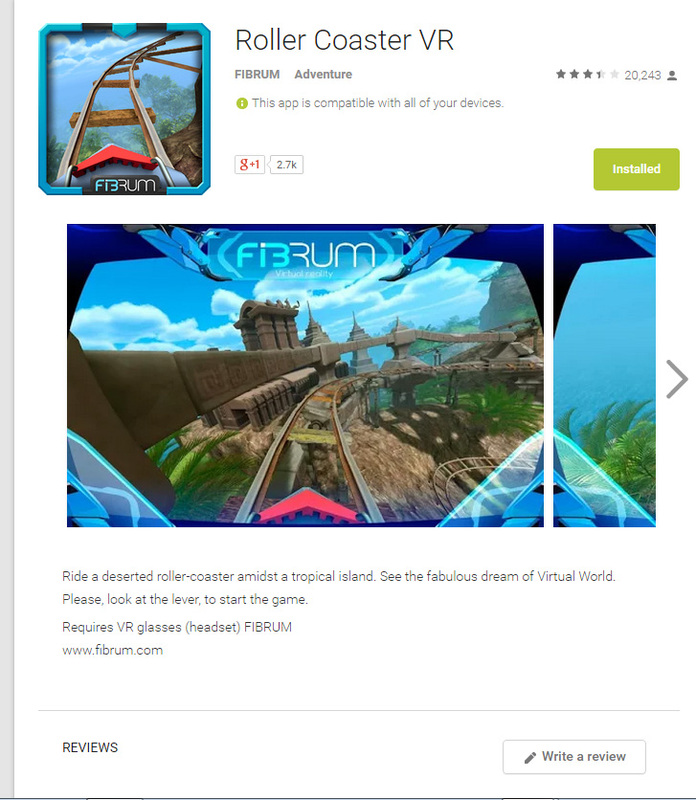 I then started to search for a roller coaster 360 demo and I plumped for FiBrums offering, whicvh after I realised I needed to stare at the go lever it was very cool, in fact I was almost glad when it finished, very, very clever. I also had a look at another offering from Jaunt – Kaiju Fury which wasn’t very inspiring, but there are lots of things out there to play with. I will start looking at things from a slightly different angle with my newly built Google Cardboard goggles and need to put them together with my leap motion for some truly immersive visual feasts! 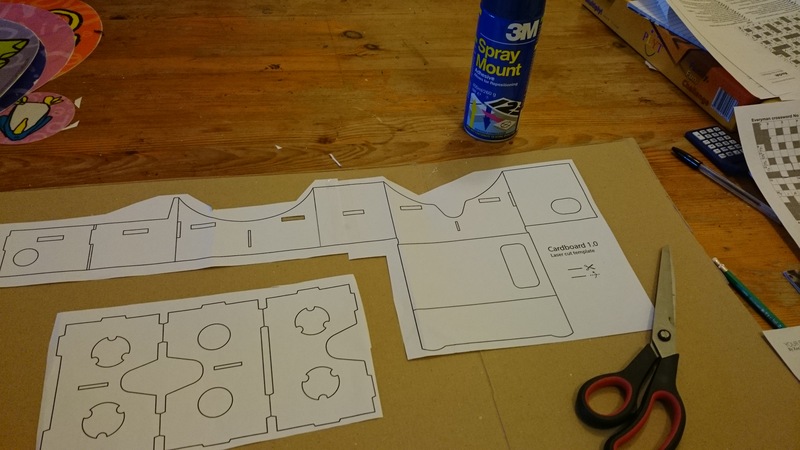 So yes, it was definitely worth waiting for, and you cannot appreciate the experience without having a go, so I highly recommend making a pair for yourself, but if you don’t have 3 hours to put one together I would buy the official version from one of the 4 big companies that sell them such as dodo case or unofficial cardboard, this link takes you to the google page that explains a little more and gives you a link to the makers sites. Dubai360 was shot with four perfectly synchronized Canon 1Dx cameras. Lenses on the cameras were Canon EF 8-15mm f4 L USM fisheye zooms. Over 88,000 photographs were taken over the course of the 30 hours of shooting, with one set of photographs being taken every 5 seconds. 22K Panoramas. These photographs were then stitched using Kolor Autopano Video into 22,000 separate panoramas to create the source frames for the video you can experience above.